As Brooklynites and other New Yorkers thaw out from the brutal winter and many take to the roads, they face a danger every bit as threatening as speeders or drunk-drivers – those who text while driving. Cell-phone related crashes along New York State's roads and highways more than doubled from 2005 to 2011 – the year that Gov. Cuomo signed a law allowing police to pull over a driver solely for driving while texting. That led to a 234 percent increase in the number of tickets issued statewide for driving while texting. In the city, on Monday, May 12, the NYPD announced a five-borough crackdown on texting and driving, as well as failure to yield to pedestrians. Police officials reminded New Yorkers that using a hand-held cellphone and texting while driving is illegal, and dangerous to both drivers and pedestrians. Many drivers – particularly young ones – continue recklessly texting while driving, despite public service announcements and videos showing the very real dangers (Example; One-fifth of all traffic accidents in New York State are from DWT...Example: Drivers who text are 23 times more likely to get into an accident than those who don't...Example: Five seconds of texting while driving on the highway is like driving the full length of a football field, blind). Last year Gov. Cuomo signed a law setting severe penalties for drivers with probationary or junior licenses caught texting while driving. 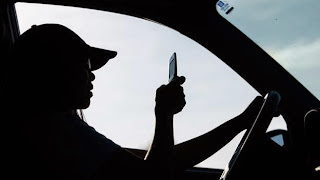 The new law also adds five points to any driver's license if he or she is found using any hand-held device while driving (which is already prohibited by state law). Statistic after statistic shows that driving while texting is a chronic problem in our society, particularly among teenagers, and it will only get worse if we do not take action to prevent this deadly behavior. That is what this  law will do: it will make drivers of all ages think twice before taking their eyes off the road to answer a message on their phone. It will avoid loss of life and better protect all those traveling on our roads and highways. The image of a teenager spending hours talking on the phone is disappearing and it's being replaced by the image of a teenager hunched over texting. It is second nature to young people. They do it all the time and when the day arrives that they get that all important driver's license, they do not stop. The statistics are alarming and deadly, and avoidable. Under the Governor Cuomo's leadership, we are giving New York some of the toughest laws on texting while driving in the nation, [which] will save lives and will also set an example for other states. The obsession and addiction of using cell phones in cars endangers the lives and safety of every driver on the road; it has to stop. Distracted driving is serious and dangerous – a driver's focus should be on the road, not their cell phone, when they are behind the wheel. Texting while driving is a serious problem that has negatively impacted far too many lives. I am the father of two boys so I face these fears every day my children get into a car. We need all drivers, especially young drivers, to understand that any message they think they need to read or send can wait-their lives, as well as others, may depend on it. Governor Cuomo is sending a strong message to drivers all across the state that texting-while-driving will not be tolerated in New York. Traffic crashes remain the leading cause of death and injury for teens, and surveys show that texting is even more prevalent among young and new drivers. This risky, selfish behavior poses a danger to everyone on our roads, and AAA strongly supports the strong deterrents put in place by this law. I applaud the Governor for leading this effort, which will help ensure that the attention of New York's drivers is focused where it should be: on the road and not on cellphones. Having experienced firsthand the horrible consequences caused by a distracted driver, I know that you don't need an academic study to prove that taking your eyes off the road means you are more likely to crash. Smartphones have more tempting features than ever before. Texting while-driving and these other distractions are extremely dangerous and we need to curb this behavior, which continues to cause traffic casualties day after day.